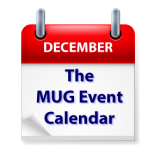 This time of year The MUG Event Calendar fills with holiday parties and announcements of no meetings because of the holiday crush, and 2017 is no exception. However, some groups continue with operations as usual in addition to the holiday celebrations. Illinois seems to be the place to be, as Joe Kissell will be talking about your digital legacy at one group, while Kevin Wright from Experimac will discuss hardware repairs at another. Minecraft is the topic of the month in Connecticut, and holiday parties are scheduled from Australia to Virginia, Pennsylvania to Nevada. Chicago Macintosh Users Group – Kevin Wright from Experimac shows us how to do an iPhone screen repair and upgrade the hard drive on your Mac to an SSD drive! MACinAwe Macintosh User Group – Christmas Party!